SMALL KUCING: Oh Ikan Oh Ikan Di Mana Ka Engkau? 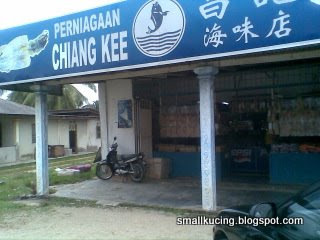 Kaw Poh have yet to find good salted fish from K.Trengganu. 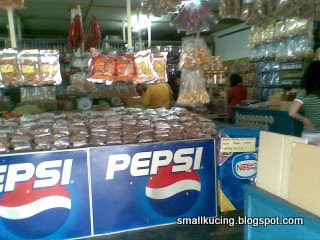 She heard people says around Kemaman, there are very nice salted fish. That is how we end up here. Saw quite a number of people stopped at this shop. This shop seems to sell quite a number of dried things. Kaw Poh found the salted fish here too. Not only that, she also bought many other stuffs. The "hay bee" from this shop looks nicer than the ones from Tan Sia Kee. 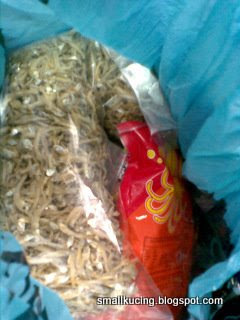 However, Kaw Poh discovered that the newspaper that wrapped the salted fish is wet when she arrived home. A good sign or not? I think it's not a very good sign, but I don't think it's so critical. Maybe they didn't dry it well enough. When get back home can just open the packaging and dry it under the hot sun again. Should be OK, i guess.